In 2016, 1 in 8 women in Australia are at risk of being diagnosed with breast cancer before the age of 85. 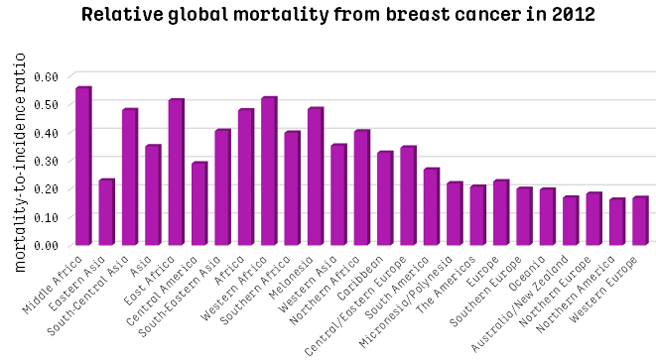 Globally, rates of breast cancer are highest in Europe, North America and Australia, and lowest in Africa and Asia. They tend to be higher in countries and continents with the highest levels of human development. The incidence rate in Australia — the number of new cases of breast cancer diagnosed per 100,000 women – is one of the highest in the world. In 2008–2012, the relative 5-year survival (a benchmark for successful treatment) for Australian women diagnosed with breast cancer was 90%, compared to women of the same age in the general population. While incidence rates are high, mortality rates from breast cancer are lower in more highly developed countries and continents. This is due to improved detection and earlier diagnosis, and more effective treatments. The relative mortality rate in Australia — the number of deaths due to breast cancer divided by the number of cases – is one of the lowest in the world. In 2012, more than two-thirds of breast cancers diagnosed in Australia were in women aged 40–69 and one quarter in women aged 70 and over. In 2016, it is expected that the incidence rate will increase with age until age group 65–69, and then decrease for age group 70–79. The incidence rate may increase again for individuals aged 80+, due to the small overall size of the age group. In Australia, a program called BreastScreen Australia organises mammographic screening to detect unsuspected breast cancers. Women aged 50–69 are invited to participate in mammograms every two years, due to their relatively high incidence of breast cancer. Women aged 40 and above are also eligible. The national breast screening program was established in 1991. 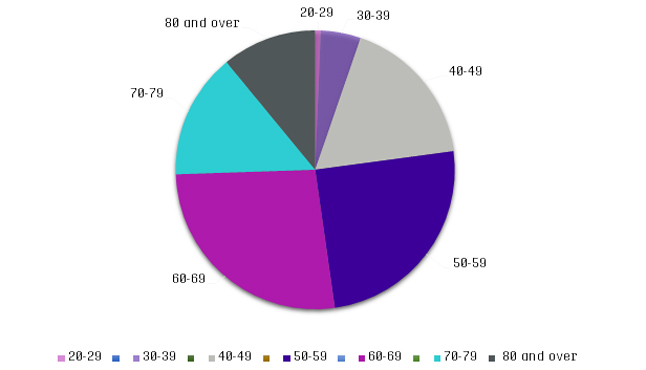 In 2009–2010, 55% of women aged 50–69 participated in this program. Detecting breast cancer early increases the chance of survival. Women of all ages are encouraged to be on the lookout for any changes in their breasts, and if this occurs, consult their GP promptly. Australian Institute of Health and Welfare (2016). 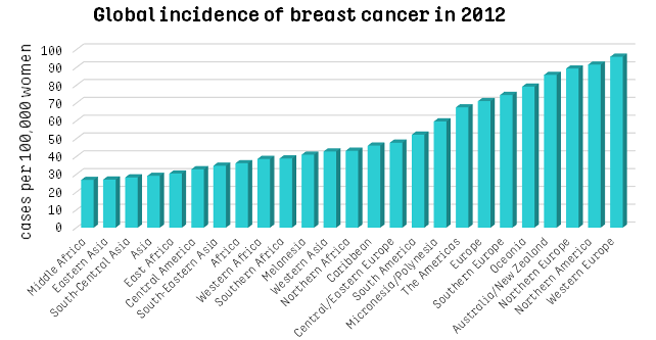 Australian Cancer Incidence and Mortality (ACIM) books: breast cancer. Ferlay, J. et al. (2015). Cancer incidence and mortality worldwide: Sources, methods and major patterns in GLOBOCAN 2012. Int. J. Cancer, 136, E359-E386. World Cancer Report 2014. Edited by Bernard W. Stewart and Christopher P. Wild. International Agency for Research on Cancer (World Health Organisation).